At Image we recognise that creating value in the relationship and delivering savings to our clients extends beyond simply providing the best product cost. We recognise valuable substantial savings can be delivered in ensuring the product selection is optimised to our client’s needs, together with the procurement process providing the appropriate control and administrative efficiency. At Image we have the experience and expertise to undertake product and process audits to identify and deliver such benefits to our clients. 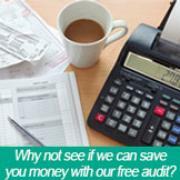 The primary purpose of an audit is to identify where, how, why, and on what our clients spend their money. We aim to deliver significant savings through product rationalisation, lower cost and efficient alternatives. In addition we aim to identify and quantify the benefits with recommendations of the most efficient procurement and control systems. At Image we can also provide Eco Audits identifying areas where we can assist in reducing our client’s environmental impact. This can extend from recommending green product alternatives to reviewing internal waste streams and identifying recycling opportunities, or joint activities to achieve carbon reduction.